Sydney Tomlinson, senior goalkeeper and co-captain of the Occidental women’s soccer team, led the team to its first-ever SCIAC championship. The team worked hard in practices and games to get to that point, according to Tomlinson. Tomlinson said she has been playing soccer since she was 5 years old. Her twin brother, Paul Tomlinson (senior), the captain of the Detox, the men’s Ultimate team, said he is close to his sister and has watched her soccer career rise. “We like to joke that she’s always been [and that] she got the athletic talent in the family,” Paul Tomlinson said. She was able to take her team to the postseason during her senior year of high school, according to Paul Tomlinson. According to Sydney Tomlinson, she was named MVP by her coaches during her junior and senior years of high school. 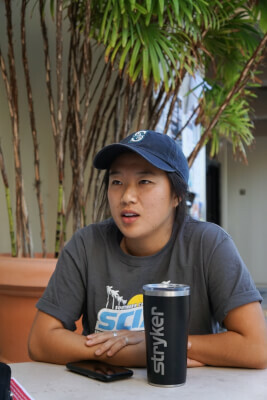 After looking at small Division III schools in California, she loved the campus, the people and the academics at Occidental, so she emailed the coaches and moved here from Seattle. She was named “First Team All SCIAC” and “SCIAC Soccer Tournament MVP,” which according to Tomlinson, means that she is one of the best people in her position in the league. Paul Tomlinson believes his sister’s drive has led her to her success. “I think it’s a self-motivation and drive to be the best she can be,” Paul Tomlinson said. Sydney Tomlinson’s teammate and co-captain, Nicole Castro (senior), is a center midfielder and played for Tomlinson’s rival in Seattle, Henry M. Jackson High School. “She’s really intense. She takes it really seriously, but she’s the perfect example of, I guess you could say, ‘leading by example,’” Castro said. According to Castro, Tomlinson is a consistent, competitive and hardworking person. “Her attitude is, ‘I’m going to do what I can to be the best that I can be.’ She’s also really competitive, and I think that ups the level of our practice, and everyone sees it,” Castro said. Paul Tomlinson has also noticed her competitive and driven attitude. “She’s always been just consistent. She’s in the goal; she doesn’t let them score on her,” Paul Tomlinson said. Colm McFeely, who started coaching Occidental women’s soccer as a part time coach in 1992 and became the head coach in 2002, acknowledged Sydney Tomlinson’s drive and hard work as well. Sydney Tomlinson said she built her skills through staying competitive and having to be the best to be able to earn a starting spot in the earlier years of her Occidental soccer career, when she had to compete with the other goalies. Tomlinson credits the team’s success to a chemistry that was not there before, which allowed them to fight hard in the championship game against Pomona-Pitzer. McFeely recognizes the confidence the team has put into each other, and especially in Tomlinson. 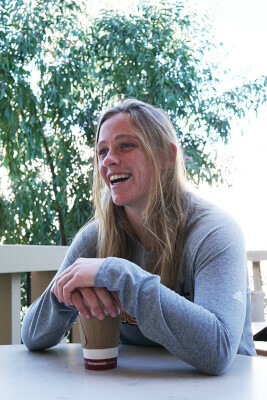 After graduating from Occidental, Tomlinson plans on taking a gap year before going to medical school, but would like to keep soccer a part of her life. According to Tomlinson, she would not have been able to get the awards she has without the help of her team. “You can’t get anything if you don’t have a really good team, so I would not have been able to get first in all SCIAC or MVP, and they are the sole reason why,” Tomlinson said. Tomlinson’s season concluded when the women’s soccer team fell 0–1 to Trinity College in the First Round of the NCAA Division III Tournament at the Hardin Simmons University Soccer Complex in Abilene, Texas Saturday, Nov. 10. The Tigers conceded in the 52nd minute to the 13th-ranked team in the country, ending their most successful season in program history.